vanilla, fruit, spice, "hints of rum"
In der Nase sehr mild und süß mit einem Hauch Vanille. Erinnert an Butterkuchen. Im Vergleich mit dem Standard Double Wood sehr viel zurückhaltender und natürlich ohne die Fruchtnoten des Sherry Fasses. Das Rumfass liegt leicht im Hintergrund. Im Mund wieder vorwiegend süß und mild. Im Abgang leicht nussig, aber nicht so intensiv wie der Double Wood. Insgesamt wenig komplexer, süßer und milder Whisky, der seinen Aufpreis zum Double Wood nicht wert ist. Das Rumfass trägt kaum zum Whisky bei und auch das Alter würde ich ihm in einer Blindverkostung nicht zuschreiben. Sweet, a bit spicy. Goes down pretty easy. impressed.. for only 43 abv, it had a nice bite but faded quickly into a nice spicey rum taste.. I expected a little more influence from the rum cask but nonetheless a nice whisky. Smooth and sweet (vanilla, rum, fruit). 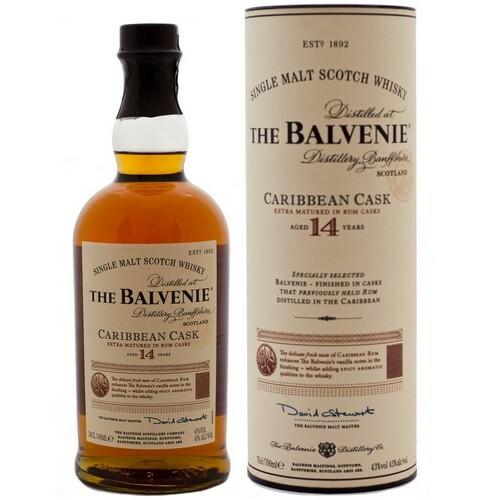 Strong presence of the rum cask finish, sweeter notes and vanilla. I was expecting more ron barrel presence. Good but nothing outstanding. 8/19/15. 89/100. Extra maturation in ex-rum casks. Certainly a good drink from balvenie. Vanilla. Slight coffee. Spicy. Slight cinnamon. Toffee. Obvious rum influences from the rum cask. Not as crafted as I would have expected. Very similar to Glenfiddich 15, just a little sweeter. Needs a little water to bring the spiciness down. Not too sweet. Mature oak. Smooth, tasteful and very enjoyable!!! It's like drinking great scotch, on a Caribbean Island, while eating twice cooked plantains, with a warm molasses glaze. It's fantastic whisky. This is the best of Balvenie, and a good price whiskey. A really exotic fruity tast with sherry, and a smooth aftertaste. Amazing, so smooth and rich, sweet. Love this! Solid scotch but I was expecting a little more. Smooth and light but flavors were a little too muted for my liking. Fruity, pear, sweet, slight peat? caramel and rum smell, taste of sherry! Really enjoyed this Balvenie, sweeter than the double wood. Enjoyed the rum hints and smoothness of this single malt. I expected a little more from this Balvenie but was a bit let down instead. Don't get me wrong, it is a fine whisky but I don't quite see the added value with the rum finish. Lacks the smoothness of the 12yo DW but makes up for some of that with a stronger, sweeter taste. A decent dram to enjoy but a bit overpriced for what you get in my opinion. Very sweet tasting. Not as much of the rum comes through on this as other bottles finished with rum (Angel's Envy, High West) Easy to drink and very approachable. A characterful whisky, light feel with a lovely spiced rum feel throughout. Hints of vanilla, toffee and fruit roll through leaving you wanting more. Rich, berries at first, developing into creamy toffee, vanilla spice, sweet & citrus fruits. Crisp vanilla forms a creamy palate with notes of apples and a hint of orange in the background. A lively spice appears, bringing a rum quality into the finish. The warm spice lingers with a vanilla focus, buttery and subtly sweet. one of my favs for sure! very complex and great tasting Scotch. Rough, burned scent that's almost sour at times. High note up front, settling to a burn. Rather homey. Delicious, smooth, if a little plain. This whiskey finishes like a smooth rum. Sweet, fruit, and sherry. Great way to introduce people to what more expensive scotch can be. love how the rum cask changes the profile and finish. it gives a sweetness that isn't normally there in a single malt. not the unpleasant sweetness of a bourbon but something better. The nose is much more appealing than the taste. Notes of vanilla, tropical fruits such as mango, and brown sugar from the rum provide an excellent introduction, but don't follow through on the taste. The taste is not bad, just light and somewhat herbal. The finish is sweet and doesn't last too long, which almost gives me the impression that I missed something. I'm not sure one sample was enough, but the price for one bottle seemed too high. Mild almost mellow with mild vanilla and toasted oak. Smooth very mild sweetness with a mild vanilla and oak similar to its aroma. No peet of note. Mild no bite modest warmth. Close, rum accented with sweet, sticky vanilla notes. Okay with a sweet dessert, but not a favourite. Rum, fruit and close wood. Sweet, strong rum with hints of sticky toffee pudding and vanilla. A wedding gift! Great whisky and was very glad to receive it. The spiced rum flavors are clear, nothing left to the imagination in that respect. Smoke is not distinct, bordering on undetectable; hear is fine.I Would share a glass of this with any visitor in our home. If you like Scotch and Rum this whisky will not disappoint. Smooth Scotch taste, with a sweet rum finish. The rum taste is very strong and very odd. I didn't like it. Sweet and vanilla dominated well constructed malty dram. Delicious, but I tend to like my whiskeys on the sweeter side. Sweet and delicious. Incredibly smooth. My favorite Balvenie so far! Ein hervorragender Whisky mit fein abgestimmten Rumaromen. very smooth... fruity and sweet. vanilla after taste. Best of two worlds. Smooth whisky taste. Spiceness and sweetness of a rum. un nez parfumé,fruits exotiques, une première bouche assez douce , une pointe de banane et poire en finition, le tout enrobé d une pointe de café et de caramel belle longueur en bouche . good. slightly fruity and sweet. very good flavor. I'll buy more of this. Nose: soft fruity / wood / sweet / very nice sent. Taste: sweet / wood / a little rum and fruit. Aftertaste: short / woody. Love it! really nice change of pace. Can only drink a little at a time. A very gentle, easy single malt. Almost too easy. The rum finish is very subtle, almost too subtle. It delivers, but doesn't excel. Honeyed nuts, oak, golden raisins and delicate notes of rum. Light, almost floral. Nice, thick mouthfeel. Very soft and sweet. Malty, with tropical spices. The gentle rum flavours mostly remain in the background. Medium finish, full of sugar coated almonds, oak, vanilla and molasses. smooth, soft taste with sharper rum after taste. The spicy after taste, though quite nice, is not my personal thing. coconut at the beginning, leading to licorice, chewy, orange zest. Erik influence is more pronounced than the nose gives away. Smells vaguely reminiscent of bananas, coconuts, and prunes. Tastes of vanilla mixed with flavours described in the nose. The finish could be longer but overall an extremely pleasant dram. A little water opens this dram up making it easier to appreciate the fantastic rum cask finish!